Our minds set up many traps for us. Unless we’re aware of them, these traps can seriously hinder our ability to think rationally, leading us to bad reasoning and making stupid decisions. Features of our minds that are meant to help us may, eventually, get us into trouble. Here are the first 5 of the most harmful of these traps and how to avoid each one of them. Lesson: Your starting point can heavily bias your thinking: initial impressions, ideas, estimates or data “anchor” subsequent thoughts. This trap is particularly dangerous as it’s deliberately used in many occasions, such as by experienced salesmen, who will show you a higher-priced item first, “anchoring” that price in your mind, for example. Always view a problem from different perspectives. Avoid being stuck with a single starting point. Work on your problem statement before going down a solution path. Think on your own before consulting others. Get as much data as possible and explore some conclusions by yourself before getting influenced by other people’s anchors. Seek information from a wide variety of sources. Get many opinions and broaden your frame of reference. Avoid being limited to a single point of view. In one experiment a group of people were randomly given one of two gifts — half received a decorated mug, the other half a large Swiss chocolate bar. They were then told that they could effortlessly exchange one gift for the other. Logic tells us that about half of people would not get the gift they prefered and would hence exchange it, but in fact only 10% did! We tend to repeat established behaviors, unless we are given the right incentives to entice us to change them. The status quo automatically has an advantage over every other alternative. Consider the status quo as just another alternative. Don’t get caught in the ‘current vs. others’ mindset. Ask yourself if you would choose your current situation if it weren’t the status quo. Know your objectives. Be explicit about them and evaluate objectively if the current state of affairs serves them well. Avoid exaggerating switching costs. They frequently are not as bad as we tend to assume. You pre-ordered a non-refundable ticket to a basketball game. On the night of the game, you’re tired and there’s a blizzard raging outside. You regret the fact that you bought the ticket because, frankly, you would prefer to stay at home, light up your fireplace and comfortably watch the game on TV. What would you do? It may be hard to admit, but staying at home is the best choice here. The money for the ticket is already gone regardless of the alternative you choose: it’s a sunk cost, and it shouldn’t influence your decision. Be OK with making mistakes. Examine why admitting to earlier mistakes distresses you. Nobody is immune to errors, so you shouldn’t make a big deal out of it — just make sure you learn from them! Listen to people who were not involved in the earlier decisions. Find people who are not emotionally committed to past decisions and ask their opinion. Focus on your goals. We make decisions in order to reach goals. Don’t become attached to the particular series of steps you took towards that goal; always consider how you can better fulfill that goal from now on. You feel the stock market will be going down and that now may be a good time to sell your stock. Just to be reassured of your hunch, you call a friend that has just sold all her stock to find out her reasons. Congratulations, you have just fallen into the Confirmation Trap: looking for information that will most likely support your initial point of view — while conveniently avoiding information that challenges it. This confirmation bias affects not only where you go to collect evidence, but also how you interpret the data: we are much less critical of arguments that support our initial ideas and much more resistant to arguments against them. No matter how neutral we think we are when first tackling a decision, our brains always decide — intuitively — on an alternative right away, making us subject to this trap virtually at all times. Expose yourself to conflicting information. Examine all evidence with equal rigor. Don’t be soft on disconfirmatory evidence. Know what you are about: Searching for alternatives or looking for reassurance! Get a devil’s advocate. Find someone you respect to argue against the decision you’re contemplating making. If you can’t find one, build the counterarguments yourself. Always consider the other positions with an open mind (taking into account the other mind traps we are discussing here, by the way). Harry is an introverted guy. We know that he is either a librarian or a salesman. Which one do you think he most probably is? Of course, we may be tempted to think he’s almost certainly a librarian. Haven’t we been conditioned to think of salesmen as having outgoing, if not pushy, personalities? Too bad this reasoning may be dead wrong (or at least incomplete). That’s just one example of how overlooking a simple data element can make our intuitions go completely astray. We keep mental images — simplifications of reality — that make we jump to conclusions before questioning assumptions or checking whether we have enough information. Make your assumptions explicit. Don’t take a problem statement as it is. Keep in mind that for every problem you’re using implicit information — your assumptions. It’s usually not hard to check the validity of assumptions, but first you need to know what they are. Always favor hard data over mental simplifications. Our preconceptions — such as stereotypes — can be useful in many situations, but we should always be careful to not over-rely on them. When given the choice, always prefer hard data. 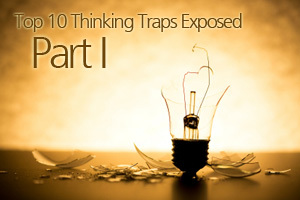 For five more thinking traps, check out part II.